Oct. 18, 2017 10:00 p.m.
Local businesses were recognized Wednesday night as the Red Deer and District Chamber of Commerce handed out their Business of the Year Awards during a gala at Red Deer College. The Chamber hands out the awards, coinciding with Small Business Week in Red Deer, and more 60 businesses were nominated, with four being awarded the prestigious titles. In the 10 employees and under category, The Bra Lounge, Fetch Haus and Breathing Room Yoga Studio and Cafe were finalists, with The Bra Lounge taking home the award. Johnson added it is great that Red Deer is full of mentors and role models in the business community and she is pleased that many new businesses are now asking her for advice. In the category of Business of the Year 11-20 Employees, 360 Fitness edged out Dance Magic Studio and Shek Interiors to take home the trophy. “It feels absolutely great to be recognized by the community,” CEO Jack Wheeler said. “The mentors and role models in the crowd were the people that got us here and the people that voted us in. It means more than you can imagine. Central Alberta Tile One, Collins Barrow and Olymel were all finalists in the Business of the Year 21+ Employees category. Olymel was selected by their peers as the winner. “It is an extremely proud moment for our employees,” Plant Manager Rob Ackerblade said. “They work hard and it is not an easy job there at the plant every day. I share this moment with them and I accept this award on behalf of our 1,500 hard-working employees. It is a really proud moment for us. 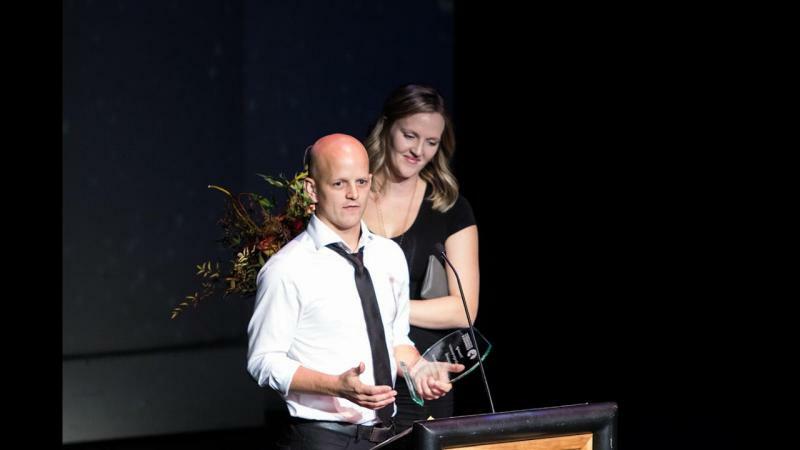 In the final category of the night Postma Electrical edged out The Curvy Brush Painting Company and Wild Brewing Co. for the Young Entrepreneur Award. “I am really grateful for our current customers, our staff and my family for being so supportive,” Owner Jesse Postma said. “The two other competitors – The Curvy Brush and Wild Brewing -are both unbelievable businesses and I expect that both of them now will be long-time friends. It is great to see such good competitors out there and great businesses in Red Deer.